Stephen joined Blake Real Estate right out of college in 1971. 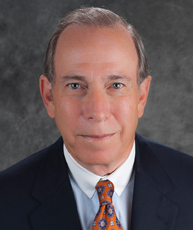 With approximately 47 years of professional experience in leasing, development, property management, and construction, he is responsible for consummating in excess of $5 billion in commercial lease, purchase and sale transactions and has negotiated numerous construction and permanent loans and joint ventures on behalf of Blake Real Estate, Inc. Stephen has acquired, developed, constructed, renovated and/or sold land, office buildings, hotels, and shopping centers, mobile home parks, and manages the portfolio of various real estate partnerships valued in excess of $1 Billion . He also supervises the day-to-day operations of the company. He is a co-founder and Executive Vice President of Superior Building Services, Inc., a multi-disciplined company that performs commercial construction, commercial contract cleaning, plumbing, and heating/air conditioning services. His years of experience and historical knowledge make Stephen a valuable member of the Blake organization. He feels his passion for excellence and leadership/management skills help to motivate team leaders and members of our various operating businesses. Stephen recognizes that the company’s most valuable asset is the firm’s employees and as such strives to foster a supportive, collegial work environment. Stephen splits his time between Potomac, Maryland and West Palm Beach, Florida. He and his wife, Barbara, have three married children and four grandchildren. In his free time, Stephen enjoys a round of golf.